The U.S. Food and Drug Administration is advising that the serious side effects associated with fluoroquinolone antibacterial drugs generally outweigh the benefits for patients with sinusitis, bronchitis, and uncomplicated urinary tract infections who have other treatment options. For patients with these conditions, fluoroquinolone should be reserved for those who do not have alternative treatment options. As a result, we are requiring the drug labels and Medication Guides for all fluoroquinolone antibacterial drugs to be updated to reflect this new safety information. We are continuing to investigate safety issues with fluoroquinolones and will update the public with additional information if it becomes available. Patients should contact your health care professional immediately if you experience any serious side effects while taking your fluoroquinolone medicine. Some signs and symptoms of serious side effects include tendon, joint and muscle pain, a “pins and needles” tingling or pricking sensation, confusion, and hallucinations. Patients should talk with your health care professional if you have any questions or concerns. My husband, Terry, was diagnosed with Pancreatic Cancer in August 2014…a death sentence in itself. There is a procedure called a Whipple that can extend life or be a cure. Only 20 percent of the patients are candidates. He was one. In 2015, he celebrated his “1st Whippleversary”….cancer free! On November 19, 2015 he had an exploratory laparoscopy to find the cause of pain he was having. Diverticulitis was discovered and a very “angry” colon. Cipro was prescribed….A life changing event. The diverticulitis pain and inflammation were eliminated. Cipro did do that. Side effects started occurring. We checked the med sheet. He had a multitude of side effects. He also had severe stomach and back pain that he put at 12 on a 1-10 scale. (He always had a very high tolerance for pain so this was highly unusual for him.) By now we were concerned about the Cipro. 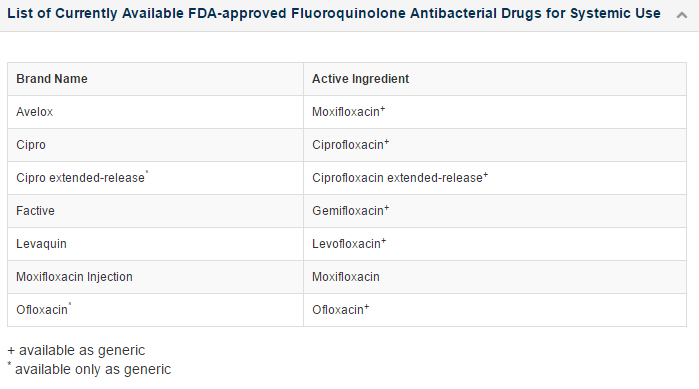 We discovered the Fluoroquinolone Toxicity Group. He also had side effects that seemed to be common within the group. He was on a downward spiral that was spinning out of control. He gained some weight. We cheered. The weight continued but only in his stomach. He was diagnosed with ascites. On January 26, 2016 they removed fluid from his abdominal cavity (2 liters) and from his lungs (1 liter). They were sure the cancer was back. The fluid was tested for cancer cells. Three days later they did a bone scan and MRI. On February 2nd, 2016 we were given the findings of the tests and fluid draw. NO SIGN OF CANCER! He continued the downward spiral. They still thought cancer was lurking some where, but we knew through our research that it was Cipro…an evil toxin under the guise of “helpful antibiotic”. We lost Terry on February 27th. He had beat pancreatic cancer…only to lose his life to an antibiotic. Hopefully with the help from the media we can end this nightmare before it debilitates or kills even more people. Thank you for running the story on the FDA statement of 5/12/16 about fluoroquinolones. Thank you for helping us save like bes by spreaing the FDAs 3rd blackbox on the most dangerous so called FQ antibiotics that are actually Chemotheraputic drugs that has been given out like Canada for a few decades in the USA and almost 2 decade in Canada for minor bacterial infections. If I was told of the high chance of serious adverse reactions I certainly would not have taken it for a suspected UTI, which I didn’t even have. Majority of patients given these poisons were perfectly healthy who only had a cold or sinus infection and all ages and even 1 pill or 30 could put you in a wheelchair and some in the ground!!! Please be informed … Know to say no to all Fluoroquinolones. Stay healthy and safe… This blackbox could take months and months to be notified from the FDA, so you still need to protect yourself and your loved ones… This is the most dangerous drug every created not because it is 1st choice for a doctor, clinic or hospital to prescribe because even 1 pill can possible kill you, or 1 pill can give you over 30 or more serious adverse reactions all at the same time! Cipro got me good almost 2 years ago. No one receives black box warnings in an e.r. I so wish I had known that an antibiotic could disabled me and no one can cure me now. I would have been leery of psychotropic drugs or other classes of drugs, but an ANTIBIOTIC????? Never in my wildest imagination would I have believed 8 days of Cipro could disable me….until it did. Oh, wasn’t in any of the so-called “Risk” categories either. I am a victim of Levofloxacin, 4 Achilles tendon tears, Have tried to find Attorney for that, but that ship sailed. However did retain one recently for an aortic aneurysm I suffered about 8 months later. I was blessed it was found on a CT scan for back issues (I have Rheumatoid Disease) If you anyone you know has had issues there is a Facebook page “Fluoroquinolone toxicity Group” Good place for support and references.